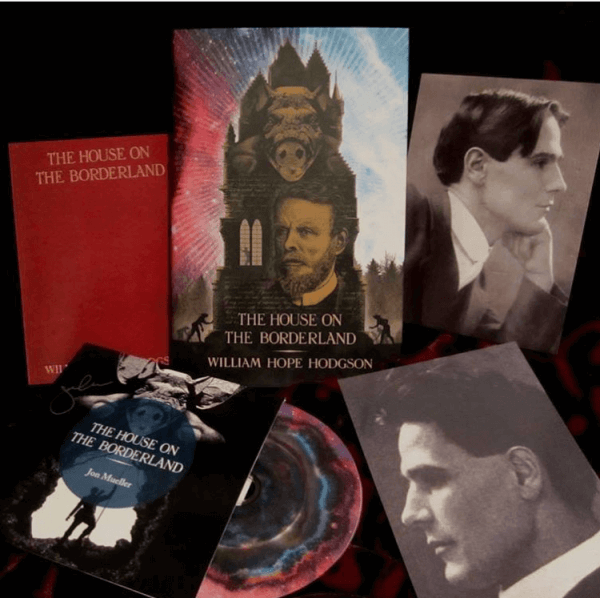 Book/CD set of ‘The House on the Borderland’ by William Hope Hodgson, published by Swan River Press, Dublin, 2018. “Almost from the moment that you hear the title,” observes Alan Moore, “you are infected by the novel’s weird charisma. Knock and enter at your own liability.” ‘The House on the Borderland’ remains one of Hodgson’s most celebrated works. This new edition features an introduction by Alan Moore, an afterword by Iain Sinclair, and illustrations by John Coulthart. Three hundred copies of this edition of 350 are signed by Alan Moore, John Coulthart, and Iain Sinclair. Each copy of the book will also include an CD of original music, composed and performed by multi-instrumentalist Jon Mueller (Volcano Choir, Death Blues) especially for this reissue. Audio performed by Jon Mueller. Recorded in April 2017 by Shane Hochstetler at Howl Street Recording in Milwaukee, WI. Mixed and arranged by Shane Hochstetler and Jon Mueller. Mastered in April 2017 by Cory Allen at Altered Ear in Austin, TX. Produced by Jon Mueller and Swan River Press. Artwork by John Coulthart; design by Meggan Kehrli. ©2018 Warm Camera Grumpy Publishing (SESAC).